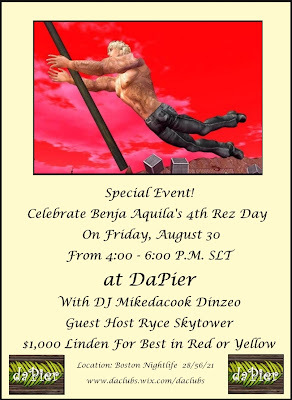 Please join me in celebrating Benja's 4th Rez Day today at 4:00 PM SLT at DaPier. There will be a 1000 Linden contest for best in red or yellow. You can wear both colors if you like. Mikedacook Dinzeo will be spinning on the decks.